The process of creativity is shrouded in mystery and lore, but that doesn’t mean that the teaching of creative writing has to remain in the dark. Can It Really Be Taught? shines a bright light on creative writing pedagogy, with a special focus on that hallmark of fiction and poetry classes everywhere – the workshop – in order to discover what works, what doesn’t, and what is purely apocryphal. ways to use the mythologized presence of the writer in film. In examining these pedagogical practices and the thinking behind them, as well as the reasons for their popularity, Can It Really Be Taught? offers a range of best practices grounded in relevant theory and based on research, experience, and success. Teachers solely responsible for creative writing, along with faculty and graduate students from all of English, will find great value in the thought-provoking essays within Can It Really Be Taught? 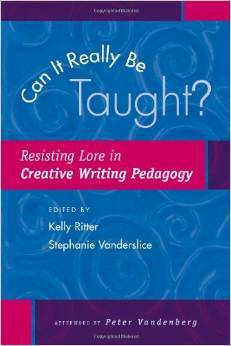 Let creativity have its mystery, but take the mystery out of teaching creative writing. Read Can It Really Be Taught? and join a new conversation on creative writing’s fundamental importance to English studies.